We love making pancakes, waffles, and French toast for breakfast every weekend. It is one of our favorite family traditions. During the fall months, I like to switch things up and make our favorite Pumpkin Pancakes. You shouldn’t be surprised since I love pumpkin everything, but these pumpkin pancakes are especially delicious! They are the perfect breakfast for a chilly fall morning. I look forward to them every single year. These pumpkin pancakes are easy to make from scratch. There is no need to go out for breakfast, you can make perfect pancakes right at home and they only take about 20 minutes to make. Start with the dry ingredients. Whisk together the flour, brown sugar, baking powder, salt, cinnamon, nutmeg, ginger, and cloves. Make sure there are no brown sugar clumps in the mix. The spices REALLY make the pancakes so don’t skip them! In a separate bowl, whisk together the buttermilk, pumpkin, egg, melted butter, and vanilla extract. Make sure you buttermilk, egg, and melted butter are all at room temperature. 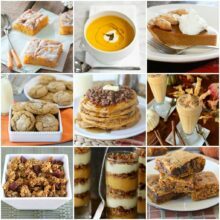 Use canned pumpkin puree. A 15 oz can will give you more than enough pumpkin. You can keep the leftover pumpkin in container in the refrigerator for up to one week. Make more pancakes or one of our favorite pumpkin recipes. Add the wet ingredients to the dry ingredients and mix until JUST combined. Don’t over mix the pancake batter or they won’t be fluffy. Cook the pancakes on an electric griddle or in a large skillet on the stove. We like to use an electric griddle because we can cook several pancakes at the same time. Use a measuring cup to pour about 1/3 cup of batter onto the hot griddle or pan. Cook on one side for 2 to 3 minutes or until bubbles appear all over the pancake. Flip and cook for an additional 2 to 3 minutes or until golden brown. Don’t smash the pancakes down with your spatula, gently flip them and let them cook. If you smash down the pancakes, they won’t be fluffy. Oh, and if you want to add chocolate chips to the pumpkin pancakes, GO FOR IT! When the pancakes are done cooking, it is GO time. Top the pancakes with butter and pure maple syrup and enjoy! The pancakes are perfectly spiced and taste just like fall! If you want to go all out, you could top them with whipped cream or our favorite brown butter buttermilk syrup. Beware, you will fall in love with that syrup! It is SO good! Pumpkin pancakes make a great fall breakfast or brunch. They would also be perfect for Halloween or Thanksgiving morning. Every special occasion should start with pancakes! Can you Freeze Pumpkin Pancakes? Yes! Double the recipe and make extra pumpkin pancakes to keep in the freezer. When the pancakes are completely cool, put them in a freezer bag and freeze for up to 2 months. To reheat, put the pancakes in the toaster or microwave. 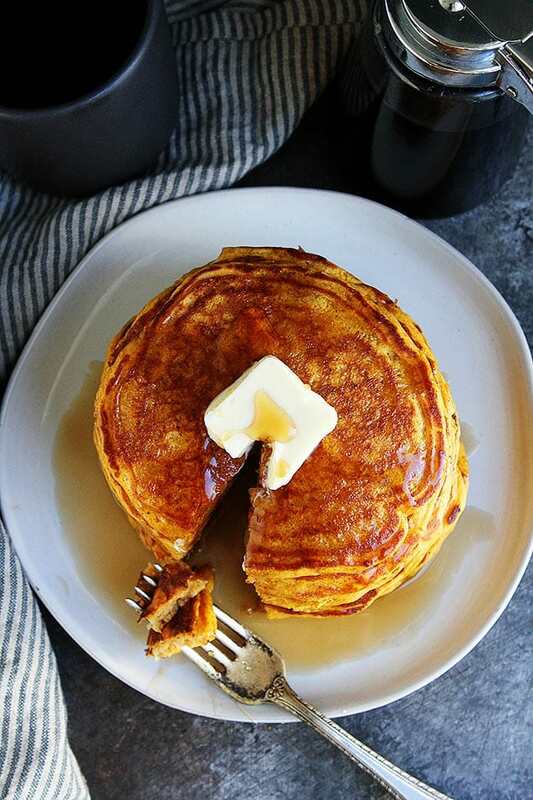 This easy pumpkin pancake recipe is sure to be a fall favorite! Enjoy for breakfast, brunch, or even make pancakes for dinner! 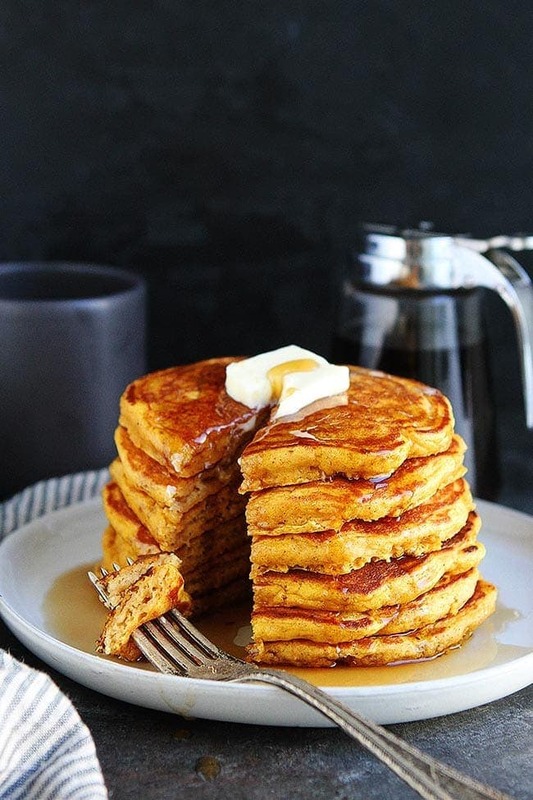 There is not a bad time to enjoy these delicious pumpkin pancakes! Preheat an electric griddle pan to 350 degrees F.
In a large bowl, whisk together flour, brown sugar, baking powder, salt, cinnamon, nutmeg, ginger, and cloves. Set aside. In a medium bowl, whisk together buttermilk, egg, pumpkin, melted butter, and vanilla extract. Add wet ingredients to the dry ingredients and stir until just combined. Don't over mix the batter. The batter will be thick. You can add a little more buttermilk if you want thin pancakes. Coat with griddle pan with nonstick cooking spray. Pour about 1/3 cup of batter onto heated skillet. Cook on the first side until bubbles begin to form, about 2-3 minutes. Carefully flip pancake over and cook for another 2-3 minutes or until golden brown. Continue this process to make the rest of the pancakes. Serve pancakes warm with butter and maple syrup, if desired. *Note-if you don't have an electric griddle pan, you can use a skillet and make the pancakes on the stove. Heat the pan to medium heat, spray with nonstick cooking spray, and cook the pancakes in the pan. 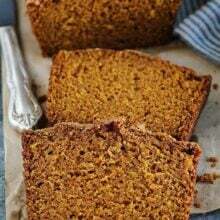 You can use whole wheat flour or all-purpose gluten free flour. Love that syrup puddle! It’s the best – and only – way! 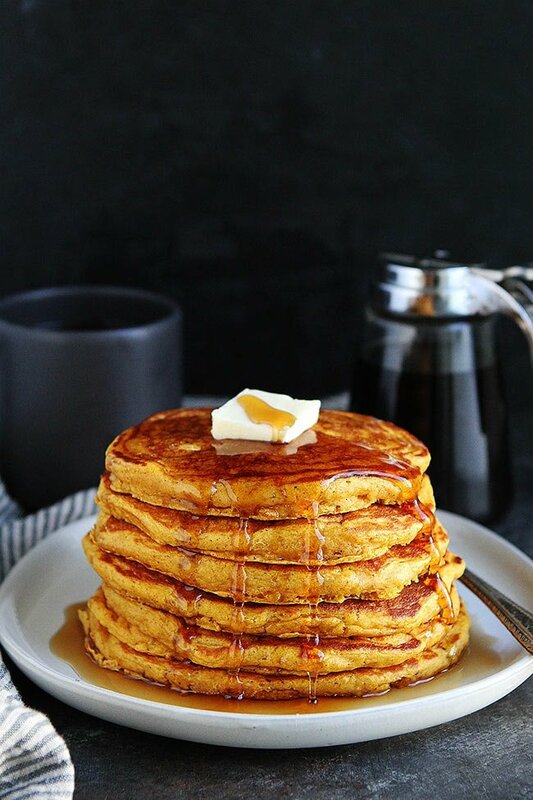 I need some pumpkin pancakes in my life! Saturday morning can’t get here fast enough so I can make these! They are the perfect pancakes for the weekend! You can find me eating these all season long! Made them with white whole wheat flour! Delicious! My kids loved them! These were so delicious! We had these for breakfast this morning with whipped cream & syrup. Everyone was in heaven. These look amazing!! Just wondering how many oancakes this makes roughly? I made these and LOVED them! they turned out really well and were very simple to make. 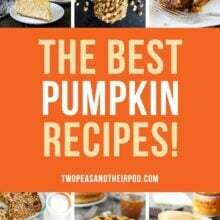 I would definitely recommend them for any pumpkin lover. These look amazing!! Any suggestions for non-dairy substitutes for the buttermilk and melted butter? You can use almond milk and melted coconut oil. Delicious! They are not too sweet. I gobbled 5 up while making them! 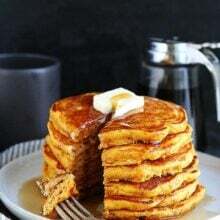 Great pumpkin pancake recipe! !